Paul Thomas Anderson (left) works with actor Joaquin Phoenix on the set of The Master. Phil Bray / The Weinstein Co.
Navy veteran Freddie (Phoenix) falls under the influence of cult leader Lancaster Dodd (Philip Seymour Hoffman) in Anderson's film, which critic Ella Taylor describes as "one of the most twisted father-son tales ever told." 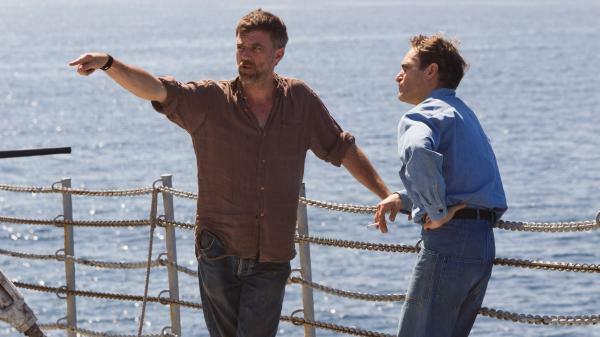 For Paul Thomas Anderson, moviemaking is not just an art; it's also about time management. "At its best, a film set is when everybody knows what's going on and everybody's working together," he tells Fresh Air's Terry Gross. "At its worst, [it's] when something's been lost in communication and an actor's not sure how many shots are left or what's going on, and the makeup department's confused." 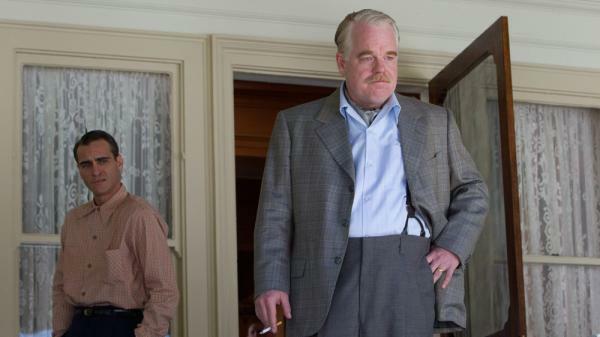 Anderson wrote and directed the new film The Master, which stars Philip Seymour Hoffman as a cult leader and Joaquin Phoenix as a troubled World War II veteran who makes his way into the group. For the film, Anderson conducted research about Dianetics — a metaphysical theory created by Scientology founder L. Ron Hubbard — and its early followers, including one couple's newsletters about yoga, new diets and past-lives therapy. He says that poring over these writings was "the best way to try to hold hands with the past and get to know these people," and that "there was a kind of wide-open feeling to a lot of things, reading, and a lot of investigation and openness to anything, which felt like a pre-hippie thinking." The Master is set in the 1950s; inspired by the look and color palette of movies from the period, Anderson decided to shoot in 65mm film. He also found looking at department-store portraits from that era to be helpful. "Those somehow were the most candid and revealing, and helped you time travel — look at these faces, look at that period, look at that era — and try and imagine not just what was happening when the picture was taken, but what would happen right after," he says. Anderson has always loved the 1950s because of the era's cars, outfits, hairdos, music — and also because of his father, Ernie Anderson. He was a World War II veteran who later became well-known as an announcer on ABC TV, famous for saying things like, "On the Looooooove Boat ..."
Growing up, Anderson would go to the ABC studio and watch his father record. "It was a step towards what I wanted to do — being in that world, being around technicians, moving parts, and microphones, video rolling — I loved it," he says. Anderson also wrote and directed the widely acclaimed films Boogie Nights and There Will Be Blood. He has been nominated for five Academy Awards, including Best Achievement in Directing and Best Original Screenplay. "Well, it's inspired by the actual questionnaire that's out there as relates to Scientology, but I had changed it and switched it around. And I came to that many years ago, and actually found it was a great way to just start writing. Forget any implications of making a film or story about this — it was really just writer's block and sitting around. The best way for me to start writing a story is to get two characters talking to each other. And if you got questions from one, you're gonna have to get answers from the other, and you can start to find out who is coming out of you when you're writing, if you know what I mean. "So I just started doing it as an exercise, and that's probably one of the scenes that I wrote first in the movie ... working from the middle. But I wrote that years and years ago. [I] didn't really know who these people were, so I just started discovering who they were by what their answers would be." "But a couple days into the film, he was feeling more comfortable and just kept sliding into this skin, that he was doing these movements that were so incredible. I just didn't want to jinx anything and say, 'What are you doing?' or 'What's going on?' You're in the middle of make-believe — you don't want to break the spell. You just want to watch him do whatever he's doing. "I have my own theories about it, because [Phoenix's character] puts his hands on his hips — sort of stuff about his kidneys being torn up from the war. Maybe something happened. Maybe it's just easier. Maybe it's comfortable for him to reach back and hold his kidneys and help him stand. But then again, yeah, there's always that thing — the way someone holds himself is an extension of what's going [on] with them on the inside. And I buy that too, for sure." "One of the stories in the film comes from Jason Robards, who famously fought in the war, was in the Navy. ... I worked with him on Magnolia. And he told me the story of coming back. I don't remember what boat he was on, but he was coming back, and V-J Day was announced, and they'd run out of booze. And they broke into the torpedoes and drank booze [i.e, fuel] out of there. And the way he tells it, he woke up the next morning on the mast of the ship, and an inch either way he would have fallen to his death. And that story just stuck with me as a great story ... something to get into the film. "I think the idea with ethanol is, you put just a few drops and then squeeze as many coconuts or papaya or whatever you've taken back with you from the island; sort of 99 percent juice and maybe 1 percent ethanol. You'll get [a] pretty good buzz." "It's a different film, so it's a different feeling. It's really that simple, but ultimately ... you know a 35mm camera, they're small. I mean you can be as small as a little speaker that I'm looking at here, sort of no bigger than a laptop. Some of these cameras are teeny. And with 65mm cameras you are limited, because they're incredibly large, and they're loud, and you can't fling them around or put them on a Steadicam. You can put them on your shoulder if have a really good chiropractor or masseuse. "So they're limiting in that way, but that was good for us. We were trying to be straightforward and simple and old-fashioned. And loud — they're very loud. You can hear bzzzzzzz." "I remember as a kid going to Pearl Harbor, and they have that monument you can go to, and it made such an impression on me. You sort of look down into the water. You see fishes moving around, and you have to think about what happened there and all those bodies ... and all these kinds of things that have gone in that water. It's a thought that always sticks with me when I do go into the ocean when I go swimming — all that's happened and all that's beneath the surface, and things coming and going. I don't know — it gets you in a good place of thinking about things in a wider way." This is FRESH AIR. I'm Terry Gross. My guest, Paul Thomas Anderson, wrote and directed several films I love: "Hard Eight," "Boogie Nights," "Magnolia" and "There Will Be Blood." And now he has a new film to add to that list, "The Master." New York Times film critic A.O. Scott described it as imposing, confounding and altogether amazing. CHRISTOPHER EVAN WELCH: (As John More) I still find it difficult to see the proof, with regard to past lives that your movement claims. PHILIP SEYMOUR HOFFMAN: (As Lancaster Dodd) Would you care to submit yourself to processing and look through the telescope, as my friend said? HOFFMAN: (As Dodd) Some forms of leukemia. In being able to access past lives, we are able to treat illnesses that may have started back thousands, even trillions of years. HOFFMAN: (As Dodd) With a T, sir. WELCH: (As More) The Earth is not understood to be more than a few billion years old. HOFFMAN: (As Dodd) Well, even the smartest of our current scientists can be fooled, yes. WELCH: (As More) You can understand skepticism, can you not? HOFFMAN: (As Dodd) Yes, yes, yes, for without it, we'd be positives and no negatives, and therefore zero-charge. We must have it. WELCH: (As More) Good science by definition allows for more than one opinion. HOFFMAN: (As Dodd) Which is why our gathering of data is so far-reaching. WELCH: (As More) Otherwise you merely have the will of one man, which is the basis of cult, is it not? HOFFMAN: (As Dodd) It is, it is, and thankfully we are, all of us, working at breakneck speeds and in unison towards capturing the mind's fatal flaws and correcting it back to its inherent state of perfect - whilst righting civilization and eliminating war and poverty, and therefore, the atomic threat. WELCH: (As More) Well, I find it quite difficult to comprehend, or more to the point believe, that you believe, sir, that time travel hypnosis therapy can bring world peace and cure cancer. HOFFMAN: (As Dodd) I have never been to the Pyramids, have you? HOFFMAN: (As Dodd) And yet we know that they are there - because learned men have told us so. May I ask: What is your name? WELCH: (As More) John More. HOFFMAN: (As Dodd) Mr. More, if I may, is there something frightening to you about The Cause's travels into the past? HOFFMAN: (As Dodd) What scares you so much about traveling into the past, sir? Are you afraid that we might discover that our past has been re-shapen, perverted, and perhaps what we think we know of this world is false information? And you can follow us on Twitter at NPRFreshAir and on Tumblr at NPRFreshAir.Tumblr.com. Transcript provided by NPR, Copyright NPR.